This baby sleep sack is perfect for that precious little one in your life. If you're wondering what to knit for baby gift giving or if you just want to knit something a little different a baby cocoon is a great idea. I love to knit cables and one of my favorites is the xo cable pattern so when I discovered I was going to be a grandma again I decided to knit this special little baby sleep sack with the hugs and kisses all around it. Somehow it felt like the perfect thing to make. This baby cocoon is a great way to swaddle your little one. I made it with the idea of being able to swaddle baby. That's why it's not overly wide but rather just right to swaddle a baby so he/she feels snug and secure. If you're comfortable with knitting circular and you enjoy knitting cables then you're going to love knitting up this baby sleep sack. The cable stitching is worked on every 4th row with the rest of the rows being simple knits and purls. In many ways it's pretty simple and a fun knitting project. And it's a nice change and maybe even a nice challenge for some of you. The cable stitching is worked on every 4th row with the rest of the rows being simple knits and purls so in many ways it's pretty simple and a fun knitting project. And it's a nice change and maybe even a nice challenge for some of you. 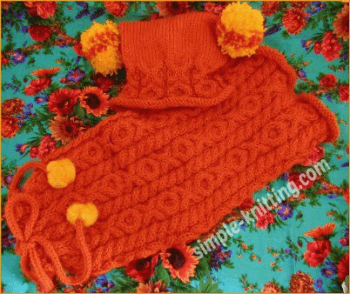 The baby hat pattern is also knit on circulars and then closed at the top with the Kitchener stitch. I’ve provided a knitting video a little further down showing you how to work it. I hope you enjoy this baby sleep sack knitting project as much as I did creating it. Baby Sleep Sack Circumference: Approximately 17 inches not stretched and at least 24 inches stretched. Length: 21 inches. Materials: 4 - Medium (Worsted) Yarn. I used Cascade Pacific (60% Acrylic, 40% Superwash Merino Wool) Each ball is 190 yards / 173 m and I used almost 2 balls for the sleep sack and a new ball for the hat. Notes: I used two cable stitch patterns in the baby sleep sack, one is the XO cable pattern or hugs and kisses cable stitch and the other is a simple 4 stitch cable stitch pattern. The XO cable pattern is worked over 16 rows and I knit it 7 times to reach 21 inches in length. It works up pretty quickly once you’ve gone around a couple of times. Continue in pattern until work measures approx 21 inches or desired length. Knit 3 more rounds and bind off loosely. Weave in ends. Make an I-cord tie and thread through eyelets at bottom of sack. You could also use ribbon if you prefer. Add little pom poms if you wish or just leave it plain. Notes: This hat is knit in the round and then using the Kitchener stitch, closed at the top. It's a fun little hat knitting project. If you don't know how to do the Kitchener stitch I've included a video below to help you and if you simply don't want to use the Kitchener stitch you could bind off all stitches at the top and seam it. Whatever works for you. I've become a fan of the Kitchener stitch as it is a completely invisible seam and it's also kind of fun to do. I worked the 16 row XO cable pattern once for the hat and the rest was simply knit. Cast on 80 stitches and join in the round being careful not to twist sts. Rnd 17 and onward: Now just knit around until hat measures 7 inches. 1. Kitchener Stitch – use this stitch for binding off and creating a seamless hat. 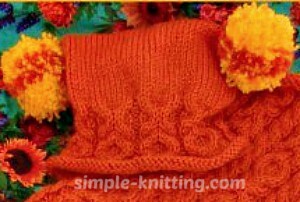 Knitting video is below showing you how to knit Kitchener stitch. 2. Bind off loosely and seam the top of the hat. Weave in ends and add pom poms or tassels or whatever your preference is. Wrap up your precious little one and enjoy!